LAWRENCE— When discussing the merits of film fan edits, the conversation needs to move beyond Jar Jar Binks, a University of Kansas scholar says. A year after the film’s release, California film editor Mike J. Nichols re-edited the movie, removing many of Jar Jar Binks’ antics and scenes that did little to advance the plot. The result, known as “The Phantom Edit,” brought the concept of fan editing into the mainstream and largely framed how critics and audiences viewed the practice. Joshua Wille, a doctoral student in film and media studies at KU, believes “The Phantom Edit” has been wrongly characterized as a reactionary work by a disgruntled fan. For Wille, “The Phantom Edit” and the hundreds of other fan edits that followed are part of a creative process reshaping how audiences view the production of films. “The really fascinating thing about fan edits is how creative they are, and that is underrepresented in previous scholarship,” Wille said. Appearing in the journal Transformative Works and Cultures, Wille’s essay, “Fan Edits and the Legacy of ‘The Phantom Edit,’” is one of the first in-depth looks at the influence of fan editing. “The Phantom Edit” was not the first fan edit, but it is the best-known. Essentially, fan edits are feature-length alternative versions of films created by fans using desktop video editing software. The alternative version is intended to complement, not replace, the original work. “It’s an interesting form of film making that is caught between debates of intellectual property, copyright laws and how to distribute content online,” Wille said. Improvements to video editing software, use of digital video formats, increased computer storage capacity and emergence of fan editing websites have contributed to the growth of fan edits in the past 15 years. 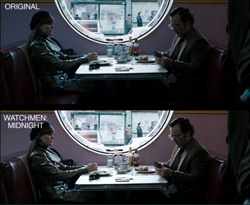 While some fan edits such as “The Phantom Edit” aim to improve the film, others are intended to cast the film in a new genre or to create a version that is closer to the director’s original vision. Wille has firsthand knowledge of fan edits. In a project titled “Watchmen: Midnight,” he reworked the 2009 film “Watchmen” to more closely resemble the narrative structure, characterizations and spirit of the 1980s comic book series. In the case of “The Phantom Edit,” many of the revisions were intended to speed up the pace of the movie.